WHO IS THIS UNCLE PHIL? 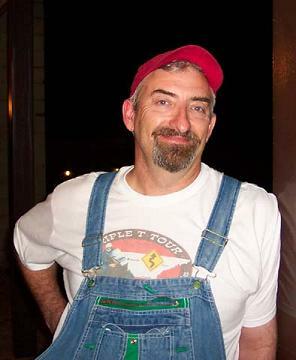 Many years ago in the southern hills and hollers of Tennessee, I was born as a seventh generation Tennessee hillbilly. I first lived in a four room little house with a little shack out back. The only time there was running water in the house was when it rained. Being raised in the hills, I learned at an early age what real stress was. I got busy eating too many green pears then had to make a mad dash for the shack out back. I just barely made it, then I looked up from the throne to see the biggest red wasp nest I'd ever laid eyes on - right on the back of the door. Now that's STRESS! When I was a wee feller of 4 or so, I wandered out to the chicken shed and there it was – a fully dressed Indian twin that my granddaddy rode! Fringe on the seat, saddlebags – the whole deal. If motorcycling was good enough for Pa, it would certainly be good enough for me one day. When I was in the first grade, the family moved to a little city farm with indoor plumbing – not a number 5 washtub in sight! There was also a creek at the back of the property that the city dumped their sewers in. So I got good at building steppingstones across it so I could get to the rock quarry on the other side to climb the rock faces. Learning to deal with the muck in the stream came in real handy as I grew older and learned the lessons of life as a poor boy. Somewhere along the way my Momma, who dearly loved music, squeezed out enough money for piano lessons. I fell in love with music, and have written a few songs and got them copyrighted. In the fourth grade, my parents finally realized their dream – a little squared up house in a subdivision and not much of a yard – heaven for them and misery for me. Thankfully, I could escape during the summers to my favorite granddaddy's house to roam the hills and hollers, ride my bicycle and be free. Two wheels came early as a way of seeing what could be seen, so it was natural to get one with a motor as soon as I could. My first chance was when I was working at a service station at 14 years old. The owner tossed me the keys to a step-through Honda 90 and said ‘Go get some change for the pinball machines'. After smoking the clutch a little bit, I was off like a wobbly rocket. When I turned 16, I went to the highway patrol office and took 1 written test and 2 driving tests – 1 for a car and 1 for a motorcycle. My parents refused to cosign a note on a bike, so I went to the dealer anyway. He said ‘Sure, I'll sell to you on credit. I know where you live – so just miss ONE PAYMENT and it'll be mine!' I learned early on the importance of giving your word about something then standing by it. I bought the old Honda 90 and finally upgraded to a brand new Scrambler 90 – just about the first new thing I ever had of any consequence. I determined then that one day I would ride the biggest motorcycle they made and travel across the country. I went off to college in the Smoky Mountains with my Honda for one quarter (all I could afford at the time). One evening as I was headed out of town, a drunk decided he wanted to see how far he could knock a feller on a bike and he did a swell job. My Scrambler was totaled and so was the helmet I was wearing. No one ever had to convince me the need for wearing helmets ever again! Outside of a few dead spots on the body, I was ready to ride again. 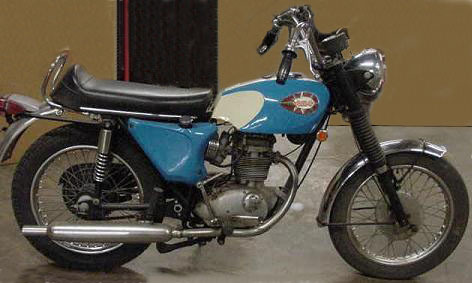 When the insurance check came, I found a ragged 250 BSA Starfire and I was back on the road. 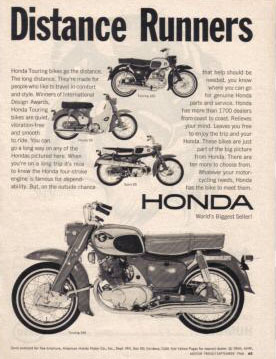 This began a love affair with Brit bikes that were to carry me many miles. 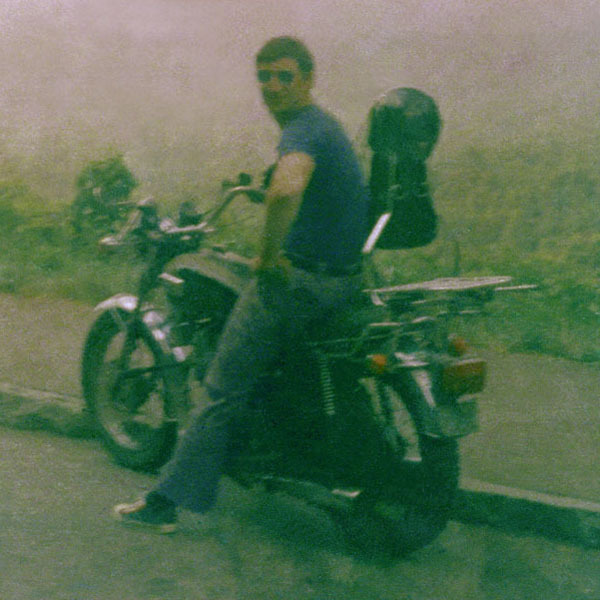 When duty called in 1971 (poor boys whose number got called did not have many options), I sold the BSA the night before I went into the USMC and was bikeless for the first time (and only time) since I turned 16. Six months before I was released from active duty, I bought a brand new 73 Triumph Trident from the money I had saved while in the military, and proceeded to wear it out. 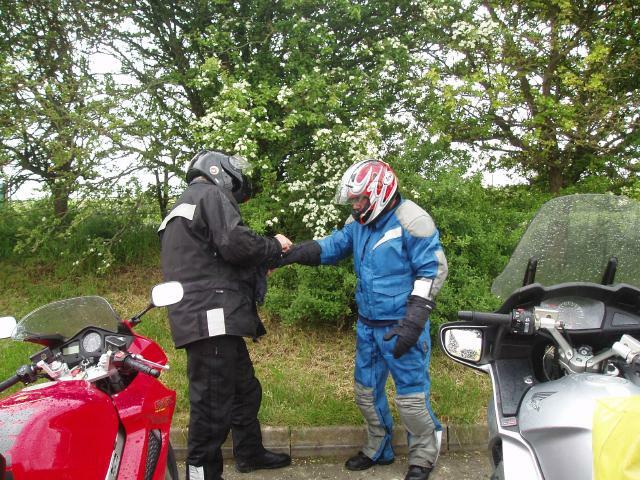 The first trip was 3500 miles in the first 2 weeks – which was just a starter for rides to come. After my honorable discharge from the USMC, I found work as a computer programmer (a skill I learned courtesy of the USMC) with a local company and started back to college at night. One evening while waiting for the classroom to open, I met this pretty sweet thing that just happened to love motorcycles. Our first conversation was about motorcycles, our first argument was about motorcycles, and our first date was on a motorcycle. So Sharyn knew what she was getting into when she decided to hitch up to this old post. After 30 plus years, she still loves motorcycles and more importantly, she still loves me! Jesus saith unto him, I am the way (the gate), the truth, and the life: no man cometh unto the Father, but by me. The LORD is my shepherd; I shall not want. He maketh me to lie down in green pastures: he leadeth me beside the still waters. He restoreth my soul: he leadeth me in the paths of righteousness for his name’s sake. As time and the miles went by, the Triumph began leaking and burning more oil than gas. I knew it was time to say good-bye to the old girl and get something else. 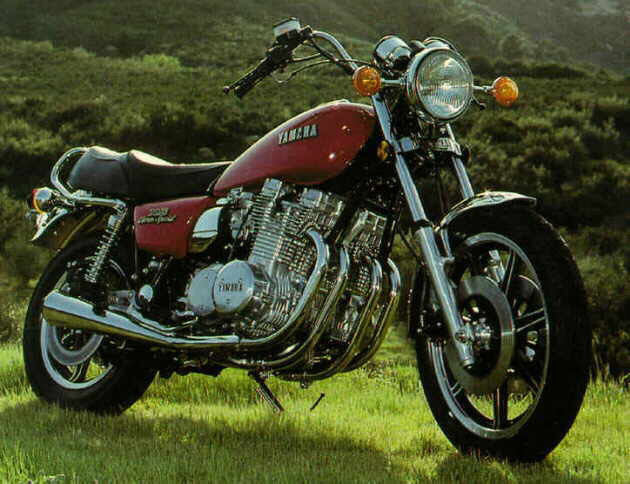 When I went looking, I found a used 78 XS1100 Yamaha, one of the largest street bikes available at the time. It had been originally owned by the shop's maintenance manager and he had done a bunch of special engine and brake work on it until it scared him too much that he sold it to me. As parts for the Yamaha got tougher to get, I had to start looking for my next bike. After a test article comparing Triumph, BMW and the ST1100 Honda came out in MCN, I decided to look at the ST1100 in 1997. The real selling point – ‘This bike has no personality – it just does what it's supposed to do quite well'. Personality? You mean like Lucas the prince of darkness electrics? Wash your hand with gas Amal carbs? Ever warm and fluctuating Zener diodes? Chains that stretched a whole link right out of the box? I visited a local dealer and they tossed me the keys. When I got back from the ride they got a check! Now here was a road machine that a feller could get real comfortable on. In fact, I loved it so well, that I bought a brand new ST1100 02 ABS from a Florida Dealer on Halloween 04 – just to have a good enough supply to last me til my toes turned up. I broke it in on the ride home and took it to my local dealer for it's first service shortly there after. So now I have the Redbird – 97 ST1100 standard and SweetTreat – 02 ST1100 ABS and Frost - 97 ST1100 ABS. 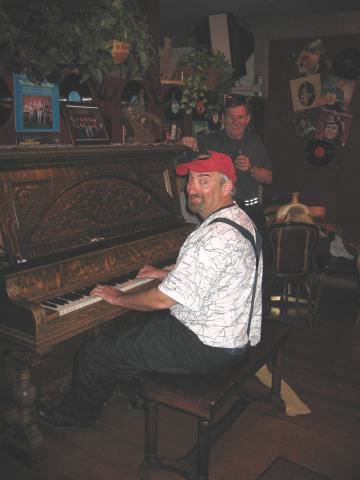 BTW – How I got the Uncle Phil tag – It seems I was often rescuing my riding friend BAMARIDER when he was in a pinch. I even took him on his first really long ride on his ST1100. My motto is – ‘Better to have it and not need it than to need it and not have it! ', so I was always had stuff to bail him out in tight spots. The picture below was taken on our trip to the UK in 2005 in the Stonehenge parking lot. Seems as if he had forgotten his waterproof gloves and Uncle Phil just happened to have an extra set. Thence the name – ‘Uncle Phil' as in – your favorite uncle!